My father owned a music store, so I grew up in a very musical family and an extensive jazz LP collection that my parents played constantly. Dad was always listening to Count Basie, Stan Kenton, Woody Herman, Oscar Peterson, Jimmy Smith and many more great artists. We got to practice to these LPs, and with the music store, we had every instrument available. So I actually became a drummer before I became a pianist. Fast forward. 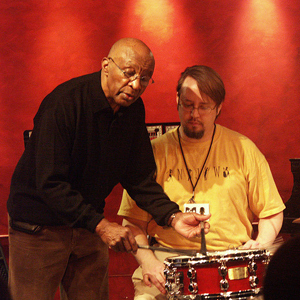 In 2004, the Jazz Workshop wrote a grant that allowed us to bring a few artists in for a series called “Jazz at the Workshop.” The day-long event featured classes, workshops, and seminars featuring local high school jazz bands, local instructors, and two famous jazz icons. That night, we finished with an all-star concert featuring our special guests. 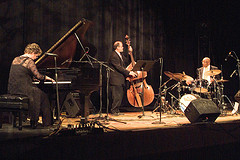 That year, our guests were drummer Ed Thigpen and saxophonist, Houston Person. What a dream! It was great to watch both of these guys teach their master classes and talk about their careers. Holy Moly! As my husband, Roger, and I rehearsed with Ed before the nighttime show (Roger on bass, me on piano), I asked Ed if we could play “Quiet Nights of Quiet Stars” with the Swamba pattern that he played on the original Oscar Peterson Trio recording. Ed had no idea what I was talking about when I said Swamba. I explained, “That cool groove you play on that tune: half samba, half swing.” Ed thought that was really funny and used the term the rest of the weekend. (I can’t take credit for it. Chris Brown always referred to that groove as Swamba.) So we figured out what songs we would play for the show and headed to the Belcourt Theatre. It wasn’t until I was onstage for sound check that I realized the magnitude of what was happening. 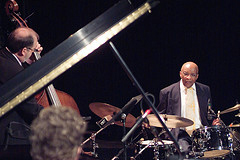 I was playing with the real live Ed Thigpen, not practicing with Oscar Peterson LPs the way I had at 15, when I was playing more drums than piano. There was no way in hell I would ever have the chops that Oscar had. So even though I was sitting in the Peterson chair that night, the memory of me at 15 made the experience intense and kinda scary all at the same time. The event was also sad, because a few days before Ed arrived, we found out he had just been diagnosed with Parkinson’s. He seemed to be doing okay during the concert, although my heart sank when, during the first tune of our set, Ed dropped one of his drumsticks and got a little rattled trying to find another. I just kept watching him and feeding him my love and energy, because I knew he was embarrassed. But he recovered just fine and continued to play wonderfully. After the set was over, he put his arm around me and thanked me for giving him the support he needed. I knew he had felt me cheering him on. I felt it too. The next day, Roger and I took Ed to breakfast, and then he came to our house, where we listened to CD’s and talked for several hours. What an honor it was to have Ed Thigpen in our home! Most of all it was an honor to play with one of my favorite drummers of all time. It was a dream come true.